Astronomy and physics education research and comments, field-tested think-pair-share (peer instruction) clicker questions, flashcard questions, in-class activities (lecture-tutorials), current events questions, backwards faded scaffolding laboratories, Hake gains, field-tested multiple-choice and essay exam questions, indices of discrimination, presentation slides, photos, ephemerae, astronomy in the marketplace, unrelated random sketches and minutiae. Nearly correct (explanation weak, unclear or only nearly complete); includes extraneous/tangential information; or has minor errors. One of the classifications is problematic, but the IAU classification scheme is systematically applied to both objects. Contains right ideas, but discussion is unclear/incomplete or contains major errors. Some discussion of difference in lifetimes, but compounded/confounded with other factors. Problematic application of IAU classification scheme. merit, but in an inconsistent or unclear manner. Uses criteria other than that defined by the IAU classification scheme. Limited relevant discussion of supporting evidence of at least some merit, but in an inconsistent or unclear manner. Implementation/application of ideas, but credit given for effort rather than merit. 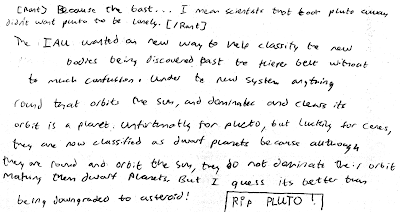 Astronomy final exam question: closer Mars? [20 points.] If Mars had originally formed closer to the Sun, discuss whether its atmosphere would now be thinner than, thicker than, or the same as it is today. Explain your reasoning. Correct. Mars lost its atmosphere due to two effects--its weak gravity (due to its small mass) is unable to hold on to molecules in its atmosphere, and lack of an ozone layer allowed ultraviolet light to break down molecules into constituent atoms, allowing them to more easily escape. 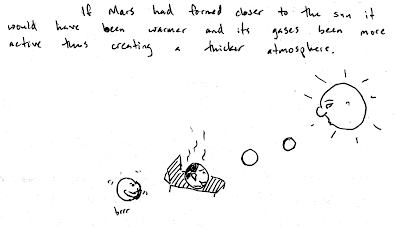 Having Mars form closer to the Sun would exacerbate both effects, as a higher temperature would cause molecules/atoms in the atmosphere to move faster. 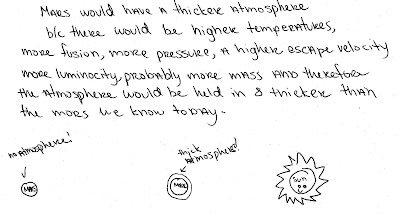 (May refer to escaping molecules as due to the Sun "burning off" the atmosphere, or calls this process "outgassing"). Nearly correct (explanation weak, unclear or only nearly complete); includes extraneous/tangential information; or has minor errors. 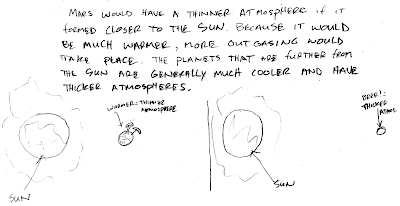 Discusses how Mars would then be warm enough to have oceans and water vapor would contribute to a temporarily more thicker atmosphere. Contains right ideas, but discussion is unclear/incomplete or contains major errors. Some discussion of difference in lifetimes, but compounded/confounded with other factors. Garbled discussion, but recognition of related factors such as mass, ozone layer, distance from Sun, temperature, and greenhouse effect. Limited relevant discussion of supporting evidence of at least some merit, but in an inconsistent or unclear manner. Involving unrelated factors, such as an inverse correlation between distance from Sun and thickness of atmosphere, Mars now being in the habitable zone and thus sustaining life, or heat causing Mars' surface to begin outgassing. 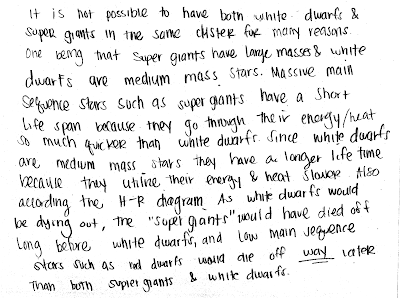 Astronomy final exam question: supergiant and white dwarf star cluster? [20 points.] 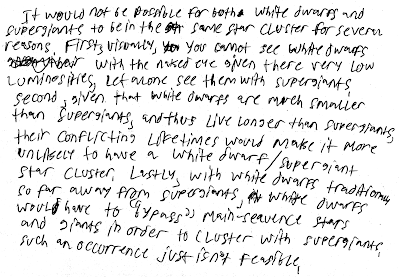 Why is it not possible to have both white dwarfs and supergiants in the same star cluster? 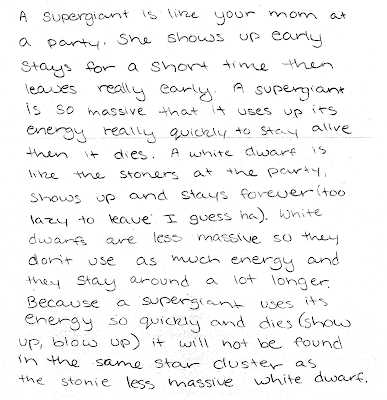 Explain using the properties of mass and stellar lifetimes. Correct. 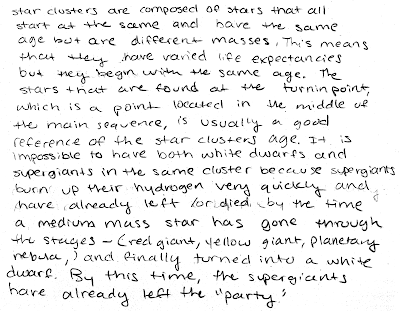 Discusses how all stars in a cluster are born at the same time and have the same age, but supergiants arise from massive stars, which have much faster evolution rates/shorter lifetimes than medium mass stars, which eventually become white dwarfs. Nearly correct (explanation weak, unclear or only nearly complete); includes extraneous/tangential information; or has minor errors. At least understands how lifetimes depends on masses, but does not explicitly connect end stages to mass (i.e., may not distinguish convincingly between using "white dwarf" interchangeably with "red dwarf"). Contains right ideas, but discussion is unclear/incomplete or contains major errors. Some discussion of difference in lifetimes, but compounded/confounded with other factors. 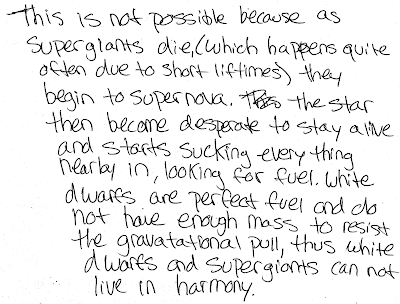 May argue that this is possible if the supergiants came from "elsewhere" to mingle with white dwarfs. Limited relevant discussion of supporting evidence of at least some merit, but in an inconsistent or unclear manner. May discuss how these stars feed on or disrupt each other, etc. (A) estimating the number of inhabited planets, and lifetimes of technological civilizations. (B) estimating the number of possible signals receivable by radio telescopes. (C) extrapolating the past progress of Earth technology. (D) assuming that it is impossible for there to be only one technological civilization. Response (A) is the definition of the Drake equation. This was asked previously this semester as a quiz question. (A) metals produced by older stars were released by supernova explosions, and became part of newer stars. (B) dark matter gradually converts metal rich stars into metal poor stars. (C) older stars concentrate more of their metals into their cores, leaving their outer layers metal poor. (D) older stars have had more time to break down heavy elements into lighter elements. Stars produce metals (elements heavier than hydrogen and helium) in their cores during their giant/supergiant phases, up through type Ia/II supernovae explosions. Along with their unused hydrogen, these metals are then scattered into the interstellar medium, which are then incorporated into later generations of stars. An old, early generation star will have metals only in its core, while a young, later generation star will have metals sprinkled in its outer layers. (A) same luminosity as, but cooler than a blue supergiant. (B) same luminosity as, but hotter than a blue supergiant. (C) same temperature as, but less luminous than a blue supergiant. (D) same temperature as, but more luminous than a blue supergiant. From Wien's law, the main sequence star and the supergiant must have the same temperature, because they have the same color. From the Stefan-Boltzmann law, for two stars of the same temperature, the less luminous star must be smaller in size. This is in reference to an Astronomy 210 final exam question. 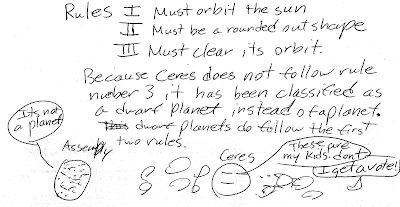 Discuss why Ceres, which orbits in the asteroid belt, is now a dwarf planet under the International Astronomical Union classification scheme. Correct. 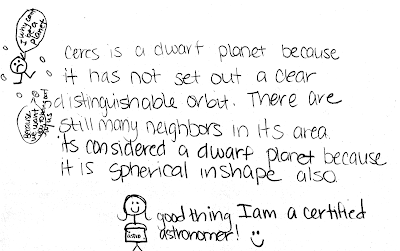 Discuss how Ceres directly orbits the sun (and thus not a moon), and has a rounded shape (and thus not an asteroid), but because it neither has cleared nor dominates its orbit, it is not a planet, but a dwarf planet. Nearly correct (explanation weak, unclear or only nearly complete); includes extraneous/tangential information; or has minor errors. Contains right ideas, but discussion is unclear/incomplete or contains major errors. Problematic discussion of IAU classification scheme. 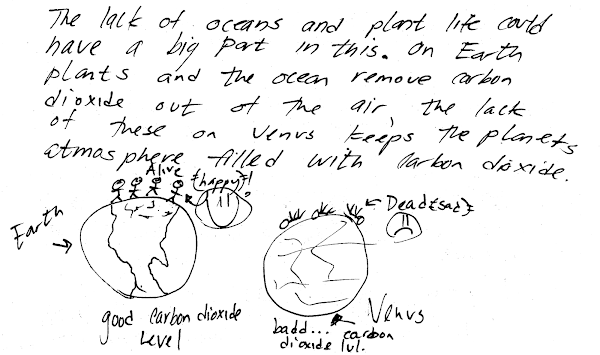 Discuss why Venus' atmosphere currently has more carbon dioxide than Earth's atmosphere, even though volcanic activity on both planets outgassed the same amount of carbon dioxide. 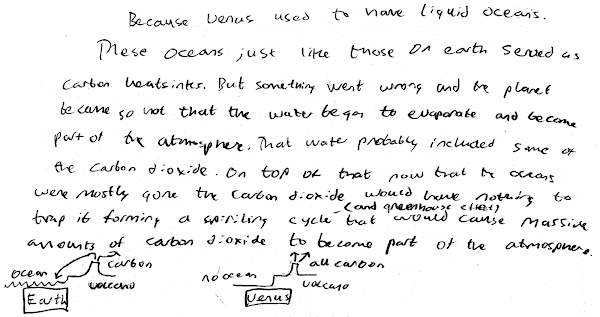 Explain using the properties of greenhouse gases and geological activity. Correct. Due to Venus being closer to the sun than Earth, Venus' oceans evaporated and this water vapor contributed to its "runaway greenhouse effect," as there is no way to reduce the carbon dioxide in its atmosphere, compared to Earth's oceans, which do manage to provide a sink for its carbon dioxide. Nearly correct (explanation weak, unclear or only nearly complete); includes extraneous/tangential information; or has minor errors. May involve plants in addition to oceans. Contains right ideas, but discussion is unclear/incomplete or contains major errors. 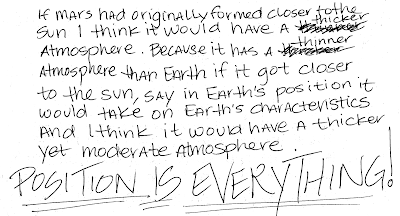 Garbled discussion, but recognition of related factors such as distance from Sun, mass, temperature, and the greenhouse effect. Limited relevant discussion of supporting evidence of at least some merit, but in an inconsistent or unclear manner. May discuss how certain stars are fainter, or blocked by intervening matter, etc. Implementation/application of ideas, but credit given for effort rather than merit. Involving unrelated factors. 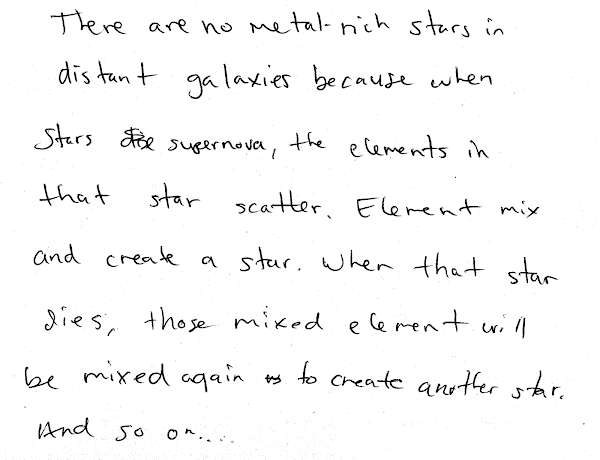 Astronomy final exam question: no metal-rich stars in distant galaxies? 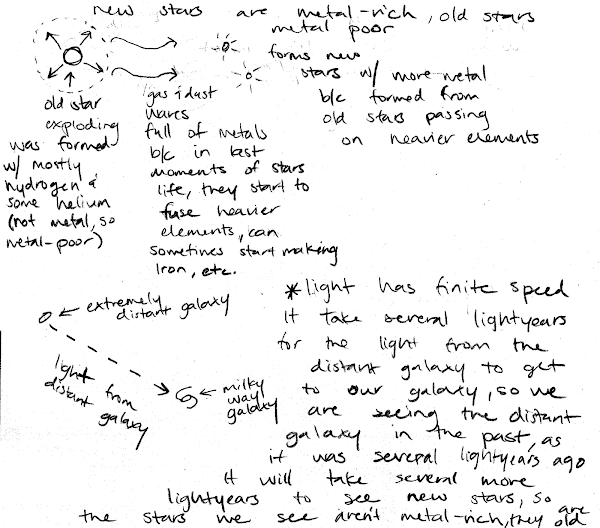 Discuss why there are no metal-rich stars observed in the extremely distant galaxies that can be observed. 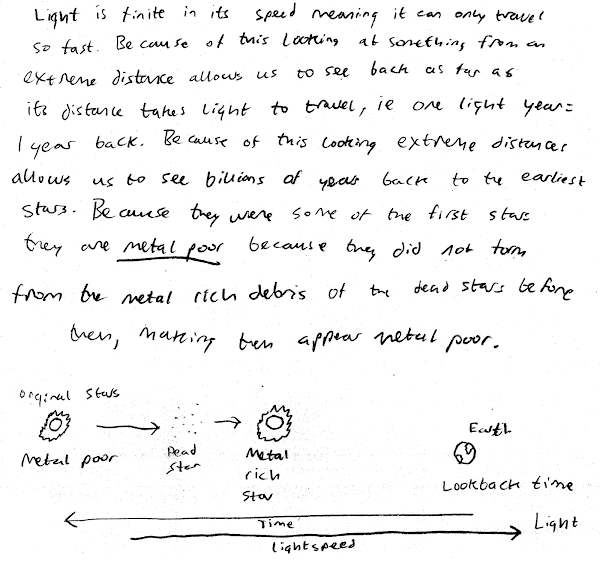 Explain your answer using the properties of stars and light. Correct. 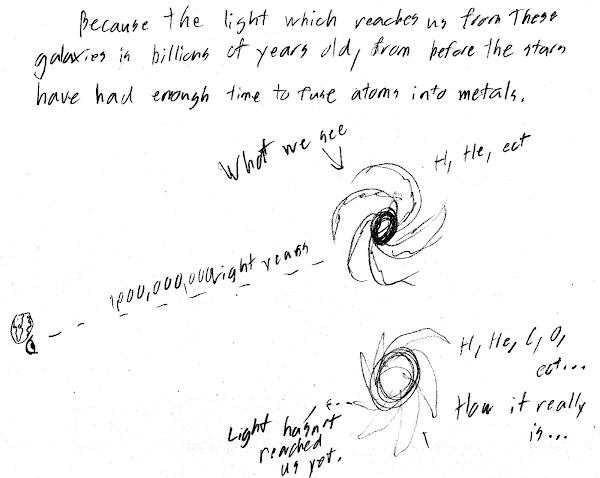 Discusses "look-back time," where the finite speed of light makes distant objects appear as they did in the past; and how the first generation of stars would be nearly hydrogen only, and contain very few metals. Nearly correct (explanation weak, unclear or only nearly complete); includes extraneous/tangential information; or has minor errors. 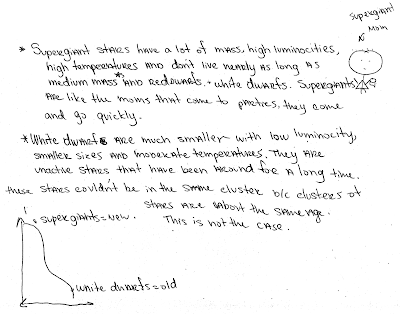 At least understands nucleosynthesis process of metal-poor to metal-rich subsequent generations of stars. Contains right ideas, but discussion is unclear/incomplete or contains major errors. Effort--beliefs about the kind of activities and work necessary to make sense out of physics--whether they expect to think carefully and evaluate what they are doing based on available materials and feedback or not. Perhaps most notable this semester is a higher gain in coherence, no loss in reality, and a smaller losses in concept and effort compared to previous semesters. Unique to this semester, compared to previous semesters was not just the mere implementation of electronic response system "clickers" (Classroom Performance System, einstruction.com), but the use of known best practices of using clickers (i.e., "think-(pair)-share"), from current education research. 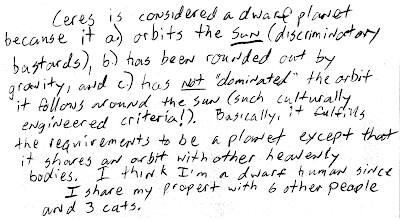 More analysis on the impact of using clickers on this introductory astronomy class will be forthcoming on this blog. [4.0 points.] Why are planets that orbit massive main sequence stars not thought to be good candidates for life to exist? (A) Massive main sequence stars are too luminous. 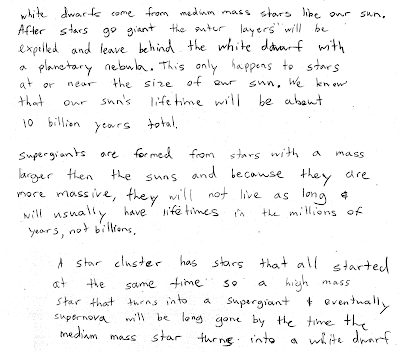 (B) Massive main sequence stars have short lifetimes. (C) These planets would be geologically dead. 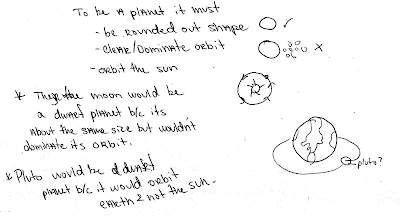 (D) These planets would be too large. Massive star have main sequence lifetimes on order of millions of years (or even less), much less than how biological life arose from chemical evolution arose on Earth (on order of billions of years), with the caveat that this process would take the same amount of time elsewhere. [4.0 points.] ε Eridani is a star that has an apparent magnitude m = +3.72 and an absolute visual magnitude M_V = +6.2. Approximately how far away is ε Eridani from Earth? (A) Much farther away than 10 parsecs. (B) A little farther away than 10 parsecs. (C) Exactly 10 parsecs away. (D) Closer than 10 parsecs away. When brought to the "fair distance" of 10 parsecs (thus changing its apparent magnitude to absolute visual magnitude), ε Eridani now seems to be dimmer, indicating that it must have moved away to the Earth during this process. Thus ε Eridani must be closer than this fair distance of 10 parsecs. 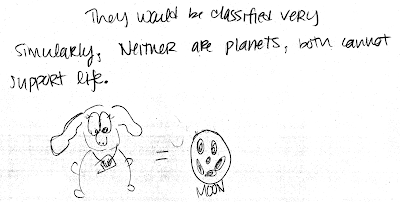 This doodle was found on the back of an introductory astronomy exam, presumably a caricature of the instructor. [3.0 points.] A square opening is made in a metal plate. The metal plate is cooled down from room temperature to a final temperature of 100 K. What happens to the size of the square opening as the metal plate cools down? (A) The square opening becomes smaller. (B) The square opening becomes larger. (C) The square opening remains the same size as before. All dimensions in a rigid object will contract proportionally when cooled (and expand proportionally if heated). [3.0 points.] How many grams of He atoms are there in 5.0 moles? The molar mass of He is 4.0 unified atomic mass units; that is, there are 4.0 g per mole of He atoms. Since there are 5.0 moles of He atoms, then there are 20 g of He atoms. Response (A) is 4.0/5.0; response (B) is 5.0/4.0; response (C) is 4.0*1.7 (in reference to another sample of 1.7 moles of Ne atoms discussed in a later, related question). (A) oceans, when it was younger. (D) vertical motion of magma under the crust. Magma flowing up through hot spots in the thick, static crust of Mars have built up large shield volcanoes on Mars. [4.0 points.] What causes Earth's plate tectonics? (A) Convection currents underneath the crust. (B) Tidal forces from the moon. (D) Asteroid impacts that cracked the crust. Lateral mantle flow below pulls the crust in certain directions; hot, rising magma produces new crust formation at midocean rifts; while cool, sinking magma occurs at subduction zones. II. Shape "rounded-out" by gravity. III. Cleared/dominates orbit around sun. Which of these qualifications are met by an asteroid? (D) Both I and II. (E) Both II and III. (F) Both I and III. Asteroids orbit the sun, typically between Mars and Jupiter. However, they are irregularly shaped (if they were spherical, they would be dwarf planets), and they have not cleared out nor dominate their orbits (if they did, they would be planets). The Star Properties Concept Inventory (SPCI, developed by Janelle Bailey, University of Nevada-Las Vegas) was administered to Astronomy 210 (one-semester introductory astronomy) students at Cuesta College, San Luis Obispo, CA during the last week of instruction, at both the main San Luis Obispo campus and the North County campus at Paso Robles. *Excludes students with negative informed consent forms (*.pdf), the use of which is discussed in a previous post. A "Student" t-test of the null hypothesis results in p = 0.013, thus there is a significant difference between students at these two Cuesta College campuses. In comparison, the t-test of pre-test scores from both campuses was p = 0.28, which was not significant. 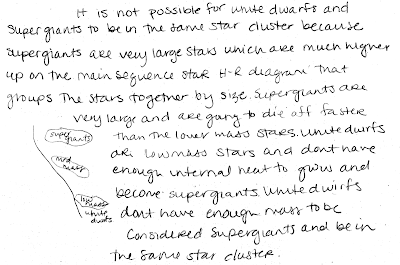 For this NC campus section, this Hake gain is greater than previous gains for introductory astronomy classes, as discussed in previous posts on this blog. Notable about both these Astronomy 210 classes at Cuesta College this semester is not just the mere implementation of electronic response system "clickers" (Classroom Performance System, einstruction.com), but the use of known best practices of using clickers (i.e., "think-(pair)-share"), from current education research. However, there seemed to have been much more peer-interaction in the smaller NC campus class than in the larger, "diffuse" SLO campus. More analysis on the impact of using clickers on this introductory astronomy class will be forthcoming on this blog. Education research: SPCI gains (Cuesta College, Spring Semester 2006-Spring Semester 2007). Education research: SPCI gains (Cuesta College, Summer Session 2007). Education research: SPCI gains (Cuesta College, Fall Semester 2007). Education research: SPCI gains (Cuesta College, Spring Semester 2008). Students at both Cuesta College (San Luis Obispo, CA) and the University of California at Davis were administered the Force Concept Inventory (Doug Hestenes, et al.) during the last week of instruction, in order to follow up on the pre-test results from the first week of instruction (which showed no statistical difference between pre-test scores). A "Student" t-test of the null hypothesis results in p = 0.0077, thus there is a significant difference between Cuesta College and UC-Davis FCI post-test scores. This Hake gain is greater than previous gains for algebra-based introductory physics at Cuesta College (0.21-0.23), UC-Davis (0.16), and for calculus-based introductory physics at Cuesta College (0.14-0.16), as discussed in previous postings on this blog. Notable about this Physics 205A class at Cuesta College is not just the mere implementation of electronic response system "clickers" (Classroom Performance System, einstruction.com), but the use of known best practices of using clickers (i.e., "think-(pair)-share"), from current education research. More analysis on the impact of using clickers on this introductory physics class will be forthcoming on this blog. Cuesta College versus UC-Davis, Spring semester 2008 pre-tests and post-tests. Cuesta College versus UC-Davis, Fall semester 2007 pre-tests and post-tests. Dramatizations of the original 1974 Arecibo message, the Drake equation, and the purported 2001 Chibolton crop circle "reply." 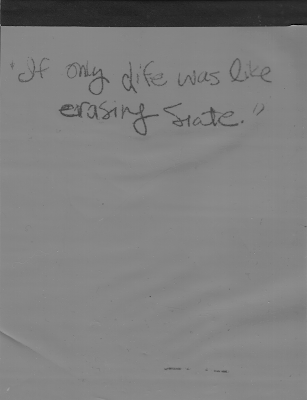 Latest scribbling on the lift-and-erase slate in the hallway, outside the office door. [20 points.] 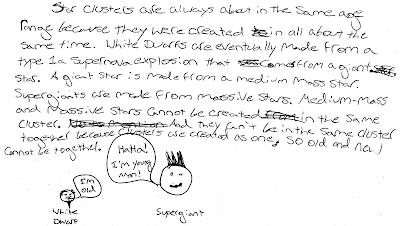 Discuss why the expansion for the universe has no center, using observations and evidence related to the Hubble law in your explanation. Correct. 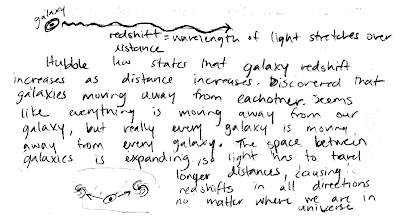 Argument involves redshifts (and thus recession velocities) being proportional to distances (i.e., Hubble's law), and how this implies that there is no unique center, any other galaxy would observe a similar Hubble's law. May also invoke no-edge, no-center argument of an non-finite universe. [20 points.] Shown at right is an H-R diagram of a star cluster, where all of these stars have the same age. Discuss whether this star cluster is very young or is very old, and explain why. Correct. Massive stars evolve quickly, and have already gone through their main sequence lifetimes to the supergiant stage, so this cannot be a very young star cluster. Low mass stars evolve slowly, so for these stars to have reached the main sequence, this must be a very old star cluster. Contains right ideas, but discussion is unclear/incomplete or contains major errors. May state that this is a young star cluster, but understands how massive and low mass stars evolve differently. Limited relevant discussion of supporting evidence of at least some merit, but in an inconsistent or unclear manner. 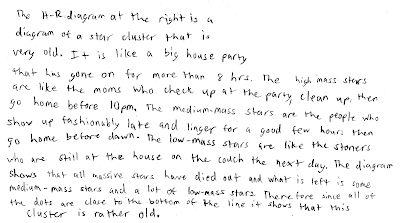 Uses other criteria to determine age of star cluster.